Earlier this year, Liv's owner and principal designer, Deboni Sacre was asked by the National Home Builder's Association to speak at the International Builder's Show in Orlando. High-End Hacks was the topic directed at builders and designers from around the country. The basics of the presentation was how to get that high-end look for less. It has often been one of our most rewarding comments from builders when they see our projects and learn about the budget -- How did you pull this off with that budget?! Design is simple when the budget it ample. We often have those clients -- and yes, they make our lives much easier! A tighter budget, whether for a construction project or designing a living room facelift, is a challenge. However, over the years we've learned some tricks to get the most out of any budget. We have one suggestion when it comes to budget: let the designer handle it! Clients sometimes have a difficult time spending a certain dollar amount per item, but often are fine with an overall budget for a space. Well... just trust us. Yes, you might spend more on that rug than you really wanted to, but we'll make it up somewhere else. A great designer can work within a budget extremely well. Here are four of our favorite tricks for making your home feel more expensive. Hack #1 Splurge in a few places where it matters. You'll save somewhere else. The most important thing is to set a budget first; a realistic one. Once you have done that, it doesn't matter if one items is pricier than you expected as long as your overall budget works. In this Park City retreat for a client from California looking for winter and summer getaways, we found ways to stretch the budget. Vacation homes don't always have the same budget as a main home, but it was especially important for our clients to still feel comfortable and relaxed in their secondary space. Custom floor-to-ceiling (giant ceilings for that matter) drapes were necessary as were the leather chairs. So we had to find ways to save in other areas. We opted for less-expensive dining seating and an inexpensive, simple fabric for the drapery panels to make up for the more expensive pieces. The crank table was a bit of a splurge but was another must-have in the room to make it feel more luxurious. Hack #2 Add Finish Detail- Small details in finish work make all the difference. Little architectural elements throughout your home do cost money. Some detailing can be inexpensive yet still create a great look making the space appear more luxurious. 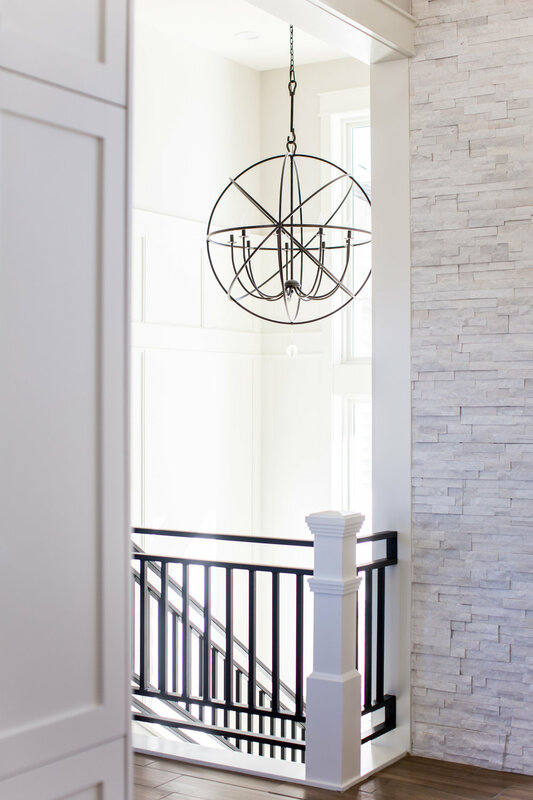 In the entry of this Utah Valley Parade home we added simple paneling and a subtle ceiling detail. This home needed some detailing, but we had to be careful with budget control. We found a few spots for detail. We decided the entry was a must-have to create an impeccable first impression. Finish detailing on the walls in this masculine office by Marie Flannigan Interiors completes the space. Without the simple detail the space wouldn't have that luxury feel. The large-scale art (see hack #3! helps the cause as well. The detailing in this room is simple, yet that subtle and inexpensive wall treatment (along with the fabulous furniture!) make the room feel more high end. This home built by Ebuilders and designed by Erin Hansen had a few, unique finish details throughout this space that didn't break the bank. Hack #3 Large Scale- Scale matters in luxury design. Going bigger on lights, upholstery, or even accessories will make your space feel more high end. You need fewer pieces, which often helps on budget, which also allows you to get a few nicer pieces. Try two or three accessories on a console instead of a dozen. Finding a light large enough and within the budget isn't always easy. In this entry of our Fox Den new build, large scale was high priority for impact and visual weight. Hack #4- Mix finishes. This tip surprises many people, but it's a tried-and-true trick we've been using while this mixing-finishes trend is so hot. Staying with all one finish often doesn't give the depth to a space that makes it feel rich. Add variety in your cabinet hardware, lighting, plumbing fixtures, door hardware and even window treatment hardware. Almost every home needs touch of black. Matchy finishes will cheapen a space. In this Fruit Heights, Utah remodel we mixed various shades of brass fixtures with polished chrome and added in black for depth and variety. Dana Wolter Interiors doesn't go overboard with the gold (most typical mistake we see!) in her masterfully designed kitchen. Gold touches are nice and grounded with black detailing in lighting and hardware.